Your trophy is out there! Flaming Gorge Country is one of the premier fishing destinations in the United States. We not only have one of the most diverse fisheries, but also the area has been dubbed the most scenic trophy trout destination in the world. There are hundreds of places to fish within an hour drive of Lake Flaming Gorge. Bringing your little one out for her first-time fishing? Hunting for a new spot to cast your line for the annual guy’s trip? 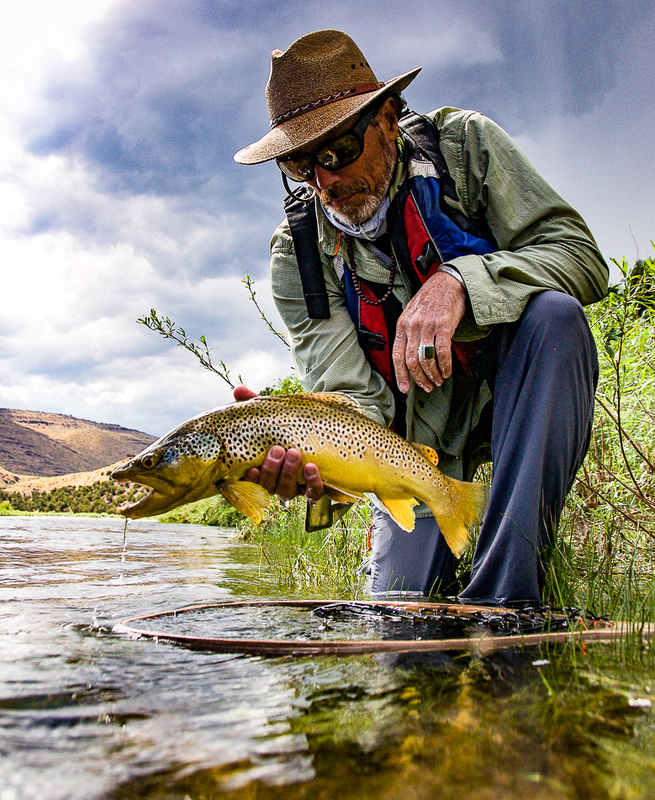 Want to escape the craziness of your everyday life and sink into the solitude of fly fishing? No matter your desire, Flaming Gorge Country can grant your fish wish! Fishing with the family is not only a highly rewarding activity, it’s also one of the most inexpensive ways to spend quality time doing something fun in nature. The basic starter gear will cost less than $50, but that investment will help you create priceless memories for years to come! Here are a few tips to get you started if you are new to the sport. You need a spinning rod with line, needle-nose pliers (for safely releasing all those fish you’ll catch!) and lures or bait gear. Bait gear includes your bait of choice (like worms), hooks, a little weight and a bobber. This is by far the most popular method of fishing, especially if you plan to keep your catch. But it can get a little messy since you have to constantly re-bait the hook. Lures are easily attached and much gentler on fish you intend to release. Lures come in a rainbow of colors and sizes. One of our local tackle dealers will clue you in on which lures are best for the waters you are fishing. Young children in either state fish for free. In Utah, kids under 12 don’t need a fishing license. Adults can get a three-day, seven-day or Utah annual permit online at www.wildlife.utah.gov. To fish across state lines on the Flaming Gorge Reservoir, you must have a valid fishing license from one state and a reciprocal fishing permit ($10) from the other state. In Wyoming, you can get a one-day or annual fishing license online at www.wgfd.wyo.gov/apply-or-buy. Kids who are residents of Wyoming and under the age of 14 do not need a license. Nonresident youth (under 14) do not need a license if accompanied by an adult possessing a valid Wyoming fishing license. We have some perfect family-friendly fishing spots, including The Moose Ponds, The Flaming Gorge Dam Fishing Pier, the free Kids Fishing Hole at Red Canyon Lodge, and Little Hole on the Green River. With 11 state fishing records and two former world records, it’s no wonder that Flaming Gorge Reservoir is renowned as a trophy fishery. The 91-mile-long lake straddles Wyoming and Utah and offers boating services at three marinas – Buckboard, Lucerne and Cedar Springs. The most popular game fish in the Gorge are the trophy lake (mackinaw) trout, kokanee salmon and smallmouth bass. Fishing top water down to 50 feet you will likely catch rainbows, browns, tiger and smaller lake trout. Kokanee salmon will follow the thermocline, staying shallow in the winter and spring and going deeper as the summer months warm the water. The larger lake trout will generally stay in deeper water (70-120 feet), but they will feed in the shallower water especially in the early spring. The bass in Lake Flaming Gorge are very active in the summer months when the water has warmed a bit. You can find them on most shallow rocky points, humps and ridges throughout the reservoir. Trolling Flaming Gorge is a very popular technique, allowing anglers to cover large portions of an area while targeting multiple species. Some different trolling techniques used on the Gorge include: long lining, dipsy divers, weighted line or down riggers. Vertical jigging is another technique used to target some of the game fish in the reservoir, especially the kokanee and mackinaw. The theory is to sit on top of the areas where the fish tend to be, using an electric trolling motor or anchor system while bouncing your favorite jig – baited or not – in front of their faces. A very effective way to catch fish on Lake Flaming Gorge – whether by boat or from shore – is casting and retrieving. There are thousands of different lures and jigs that work for this method. Fly fishing streamers can even be effective. Bait fishing, whether with a bobber or weighted, is another common technique. Night crawlers and power bait are both recommended. A very popular winter activity is ice fishing. In cold-weather months, the larger lake trout are in the deeper water and can be caught using vertical jigging techniques. The smaller trout and kokanee are in shallower water, where it’s best to use smaller jigs and baits. It is becoming very popular to fish for Burbot – the invasive species in the gorge – through the ice at night. Premier fishing tournaments occur year-round on the Gorge. The Flaming Gorge Fishing Derby, Burbot Bash and Burbot Classic are just a few. For a complete list of fishing events in the area, go to www.flaminggorgecountry.com. The Green River, as it reemerges from Flaming Gorge Dam, has become a legendary tail water fishery. The water released from the dam is regulated to maintain an optimum temperature and flow that has created a world-famous blue ribbon trout fishery. The Green River’s clear, emerald waters support a large population of trout, with rainbows and cutthroat being more common just below the dam and browns dominating downstream. Annual surveys have revealed an incredible trout population. Most states boast that their blue-ribbon steams have 5,000-7,000 fish per mile. But some stretches of the Green carry as many as 14,000 fish per mile! Fishing is restricted to artificial flies or lures, and catch-and-release is highly encouraged. Fly tackle is most commonly used, but spinners, jigs and Rapalas are also effective on these waters. Additionally, insect hatches are prolific. Scuds are a primary food source and are effective throughout the year. Midges work on and below the surface during the winter and early spring. Blue-winged olives hatch in incredible numbers in the spring. Big cicadas produce exciting fishing during the early summer. Ants, hoppers and many dry fly patterns work well through the summer and early fall. The Green flows through a scenic, steep-walled canyon. The rugged terrain allows access in only three areas: just below the dam, Little Hole and Browns Park. You can drive to these locations and fish your way up or downstream, or float the river in a drift boat or rubber raft. If you really want to get away from it all, the famous High Uinta Wilderness is the place to be. Here, there are over 600 hundred natural mountain lakes and thousands of streams that are packed full of brookies, cutthroat, rainbows and – if you search hard enough – grayling. Tip: When a high-country lake is “on,” get ready for some fast and furious fishing! If things are slow, take a short walk to the next one. Some of the more popular and easily accessible lakes in our area include Matt Warner Reservoir, Browne Lake, Sheep Creek Lake, Long Park Reservoir and Spirit Lake, just to name a few. But if you are more adventurous and like to get out and hike, check out Tamarack Lake, Daggett Lake, Fish Lake or Island Lake. The Flaming Gorge high country is a very special place that has remained naturally wild. So while you’re out and about, keep your eyes peeled for the huge moose population that calls this high country home. Other wildlife you might spot include river otter, Rocky Mountain bighorn sheep, Rocky Mountain elk, yellow-bellied marmot and bald eagle. Located 37 miles north of Green River, visitors can find Seedskadee by driving west on I-80 to the LaBarge State Highway 372 north. Established in 1965 as mitigation for the construction of Fontenelle and Flaming Gorge Dams, the refuge encompasses more than 20,000 acres along the Green River between Fontenelle Dam and the town of Green River, Wyoming. While the numbers of fish at Seedskadee may be less than in the Green River below Flaming Gorge Dam, the size of the fish is incredible. Huge trout await those willing to invest time on these waters! Flaming Gorge is crawling with guide shops, marina and lodges that sell licenses, fishing tackle and offer plenty of free advice. However, we think the best way to get acquainted with our waters is with one of our fun-loving local guides. These experts know just where to look for an angling adventure that will make memories to last a lifetime! Thank you for visiting http://www.flaminggorgecountry.com/anglers-guide! Be sure and revisit flaminggorgecountry.com frequently for content updates and more.